First Lady Michelle Obama is going after boxed mac and cheese, saying, "Cheese dust is not food." I remember, actually, Sam Kass [former executive director of Let’s Move! and White House chef], at one point—we first met him because he was one of the people early on when we were campaigning who came in to help me cook while I started campaigning, because I just didn’t have the time to do it. And he was a core of our processed-food elimination. And my kids loved the macaroni and cheese in a box. And he said, if it’s not real food then we’re not going to do it. If we want macaroni and cheese, we’ll cook it with real milk and real cheese. He said, there’s nothing wrong with mac and cheese, but it’s got to be real food. So my oldest daughter [Malia], who was probably 8 at the time, he took a block of cheese and he said, if you can cut this cheese up into the powder that is the cheese of the boxed macaroni and cheese, then we’ll use it. She sat there for 30 minutes trying to pulverize a block of cheese into dust. I mean, she was really focused on it, and it just didn’t work, so she had to give up. And from then on, we stopped eating macaroni and cheese out of a box, because cheese dust is not food, as was the moral of that story. During the interview, which was released Monday, Mrs. Obama also talked about the challenges of her Let’s Move! campaign, and that Eleanor Roosevelt, one of her "idols," inspired her to start the White House garden. "Change is hard for anybody. 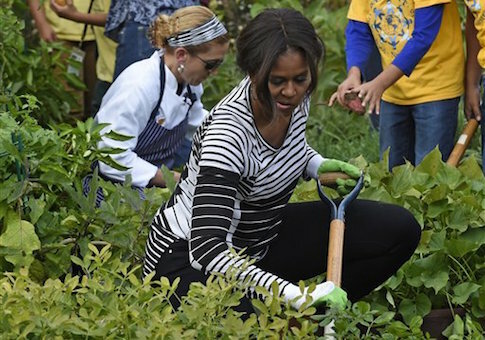 And when you’re talking about food, food is really personal," the first lady said. "So when you’re telling people to rethink their dietary habits that they’ve lived with all their lives, it’s really personal." Mrs. Obama said her anti-obesity campaign is "uplifting" and "fun," and that she is most proud of the changes to the school lunch program, which she believes will "eventually be embraced by kids." "And I think one of the most impactful things that we’ve done today when we look back on—I’ve said it before—are the changes in the school lunch program," she said. "I mean, millions and millions of children rely on the school lunch program for the vast majority of their nutritional calories. Many poor kids are getting two meals a day in the schools, and if those meals are the healthiest that we can give them, no matter what happens at home, they’re going to be ahead of the curve." Thanks to her, she said, kids now know what a turnip is. "So what happens in the schools is really impactful because that’s where you reach the most kids," Mrs. Obama said. "For the first time, they know what a turnip looks like, and they know what a fresh tomato tastes like, and they know what it does for their bodies."